After spending a number of years in essence serving a country music apprenticeship, Canadian artist Bobby Wills finally believes he has a record that may permeate the mainstream market. However in realisation of how tough it can be to crack the corporate driven Nashville labels and their tight collaboration with country radio, Bobby and his team are prepared to widen their appeal and have included Europe as a target audience for future development. 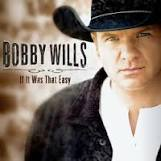 IF IT WAS THAT EASY is in effect the second full length release for Bobby Wills but the team assembled during its production has ensured that the final finished package is a top notch effort with a quality sound that should be the signal to alert the big guns. The album is a straight down the middle good ole country record that has a sufficient modern touch to its creation to sit comfortably amongst the leading lights of the Music Row- centred country music community. At a compact ten tracks long and just shy of 40 minutes running time, Bobby has managed to cover most bases of country music content while managing to leave the listener longing for a little more. This is a great trait of any record. Apart from the vocal and guitar-playing talents of Bobby, a major asset of this record is the production and writing skills of three stalwarts of the Nashville and Muscle Shoals scene who in the past have worked with such illustrious artists as Reba McEntire, George Strait and Faith Hill. This team headed by producer Michael Pyle and including both Walt Aldridge and Wade Kirby have worked as a unit with Bobby on all ten original tracks, sharing the writing credits between them. Like so much of country music, the strength of many of these songs is the innate ability to take a real life emotion and weave it into a simple but effective tale. The opening track, ‘Show Some Respect’, which has also been subjected to initial promotion, is a neatly linked chain of personal observations all underpinned by the moral of the title. This style and topic has served Brad Paisley well in the past and Bobby’s attempt is equally laudable. Another impressive number on the album is the metaphorical ‘Ceilings and Floors’ with its theme of desiring a better life for your off-springs. The title track ‘If It Was That Easy’, that concludes the album, remarks on the struggles incurred when striving to fulfil your dreams which could almost be autobiographical for Bobby. As you would expect from any country record, the ubiquitous cheating song is included and from a personal point of view, the cleverly titled ‘Did My Back Hurt Your Knife’ is the most enjoyable track of this collection. Combined with the smart lyrical input of Wills/Pyle, the song is held together by a sound that, while remaining fresh, harks back to a more traditional era. The second song earmarked for promotion off the record is ‘Somebody Will’, an uplifting track benefitting from increased guitar amplification and rousing backing harmonies. Despite committing a ‘grammar crime’ in its title, ‘Done Quittin’’ slows things down sufficiently to impress with echoes of a touch of Kenny Chesney influence. Bobby Wills has definitely made a valiant attempt in creating a record that will fit perfectly in the mature sound often featured in elements of mainstream country music and its associated radio stations. The rest is down to the marketing men and probably a large element of good fortune. However regardless of the level of success attained on the way, this album will definitely swell the fan base of Bobby and help him in finding his own niche in country music. There is certainly a market in the UK waiting to appreciate his talents.